The Weekend Edition is pulled from the daily Stansberry Digest. "Why am I buying stocks?" If you're an individual investor, chances are good that most of your liquid wealth is allocated to common stocks. You're also probably diversified, in at least some way, into derivatives of common stocks, too. Most investors own derivatives like exchange-traded funds (ETFs), mutual funds, or pension funds that invest in stocks. These "helpers," as legendary investor Warren Buffett calls them, give investors peace of mind... for a fee. What they almost never do is increase actual returns in excess of the fees and taxes they incur. Should you invest in stocks at all? If not, what should you buy instead? What could possibly offer you stock-like returns (or better) and still be completely passive and relatively safe? I don't believe it's possible to make better and safer passive investment returns than through buying the highest-quality capital-efficient businesses and holding them for the long term. The steady dividend increases that these investments will produce over several decades are virtually impossible to beat through any other investment system or strategy. Earning 12%-15% a year in these kinds of businesses... for 20 or 30 years... while reinvesting your dividends... will generate significant amounts of wealth. There's probably no better, surer, or safer way to become wealthy. That's why at least some of your portfolio should always be invested in common stocks. Few companies will perform as well as they should for the long term. Most public companies are poorly run. They're the opposite of capital-efficient, with management teams that destroy capital, reduce dividends, and render billions in losses to investors. Investors in General Electric (GE), for example, might have thought they owned one of the world's greatest businesses. (We warned them to the contrary.) But GE's investors have lost almost $500 billion since the early 2000s. And that's just the most notorious example. Most public companies are woefully managed and will ultimately fail. It's not easy to sort the best from the rest. Owning just one of these big failures for a long time can wipe out all of your other gains. That's one excellent reason to avoid buying stocks altogether: they are extremely volatile. We recently completed a thorough study of investment returns and volatility from 1991 through today. We picked the time period at random – it's as far back as we have reliable data for one of our indexes. Personally, I think looking back at the past 27 years is an important "lens." This fairly modern period has seen the impact of global central banking and radical changes to both global trade and technology. Obviously, the future could be a heck of a lot different than the past 27 years, but this period is far more applicable to understanding current financial trends than studying what happened under the gold reserve system that existed from the end of World War II until 1971. Since 1991, stocks have earned investors about 8% a year. But those returns have come at the "expense" of extreme volatility (16.2%). Even the most conservative investors (like Buffett) have seen portfolio declines of 50% or more multiple times in the past 27 years. It's difficult (or even impossible) for retired investors or folks with relatively small incomes to face this kind of volatility. Stocks are simply not a good financial tool for most people. They're risky. They're hard to understand. And you can lose a fortune if you buy the wrong ones or if you panic and sell them at the wrong time. You could have made a worse choice: gold. Gold has generated about half the return of stocks (4.4%) but has almost the same amount of volatility (15.6%). If you don't want to make any money and you enjoy seeing your portfolio balance collapse on a regular basis, gold is the right choice for you. Buying gold is a lot like going to a bar and asking for a beer. When the bartender says, "All we have left is a stale, flat keg... But at least it's warm," the gold bug replies, "Better make it a double." Now... here's the real irony. I've been buying gold bullion for almost 20 years. And I've never sold a single coin. I don't care what the price of gold is – I care about how many coins I own. And I'd like to own more, not less. My point is, there are a lot of good reasons to buy gold that go far beyond portfolio management. I own gold as a crisis hedge and as the ultimate form of savings. But as you'll see... gold should play an important role in your portfolio, too, despite its poor overall performance. So if you aren't going to own stocks (because they're extremely volatile) and you aren't going to own gold (because it's extremely volatile and offers low returns), then I suppose you should buy bonds... right? That's exactly right. Since 1991, bonds have gone up almost 7% per year and have experienced extraordinarily low volatility. Bonds have about 75% less volatility than stocks and trail their annual returns only by about 1.5 percentage points. In short, if you're willing to give up a small amount of annual returns (roughly what your investment managers are probably charging you), you can do well by investing in safe bonds. 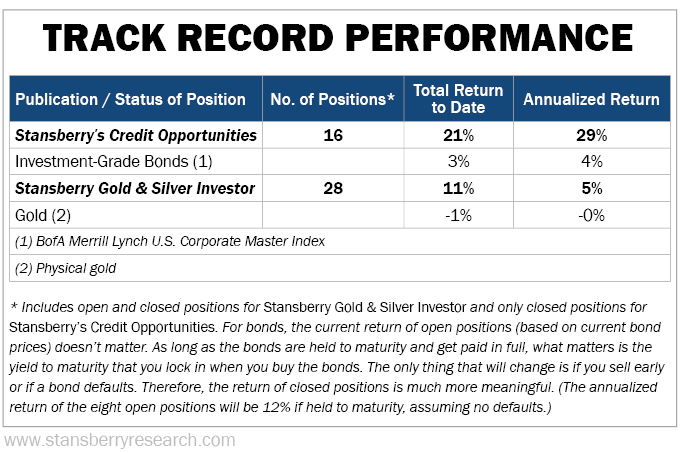 You see, to measure the long-term returns of the U.S. corporate-bond market, we're using a Merrill Lynch total return index that measures returns from investment-grade bonds. We've proven in my Stansberry's Credit Opportunities service that buying noninvestment-grade bonds at a discount can deliver annual returns of 20% or more. (Right now, the average annual return on our 16 closed positions is 29%.) Even though there isn't a good long-term index that shows what the returns would have been for wisely allocating between investment-grade and noninvestment-grade bonds, achieving better results than stocks is easily possible, with less than half the risk. Well, that's it then... We have our answer, don't we? Forget about stocks. Just read Stansberry's Credit Opportunities and keep a sensible mix between investment-grade and noninvestment-grade positions. Over time, you'll beat the stock market's returns. And you'll take a lot less risk. That has certainly been true. And it might be true going forward. But the bond market has been in the biggest bull market of all time since the early 1980s. During this study's measurement period, the average interest rate on investment-grade debt dropped from more than 10% to less than 4%. As bond yields fell, bond prices soared. It's hard to imagine that the next 25 or 30 years will see anything like these kinds of returns in bonds again. It's almost impossible, in fact, because of the zero-boundary for interest rates. And that puts a big wrinkle in our conclusion. But what if there was a safer way to own bonds? Or what if there was an investment allocation you could make that was even better in some ways than bonds... and stocks... and gold? Commodities is more or less a dirty word for most investors today because stocks have trounced them for so many years in a row. And of course, most of the time, stocks outperform commodities by a wide margin. That has been especially true over the past several decades as technology has played a big role in both reducing the cost of producing commodities and increasing commodity production. Yes, all of that is true... And it's likely to be true for years to come. But there's still a reliable way to make money in commodities. It's called "backwardation." It's a foundational principle of economics that people are willing to pay more for something today than they will to get it tomorrow. Buying commodities for delivery in the future usually costs less than buying them today in the "spot" market. The difference in today's price and tomorrow's price can be locked in with futures contracts, yielding a reasonable profit. You might not want to own grains or metals or pork bellies for the long term, but owning them in the early stages of a supply disruption can quickly make you a fortune. What if, for more than 25 years, you had followed these two proven strategies in commodities? You took half your portfolio and bought the seven (out of 27) major commodity futures contracts that had gone up the most over the previous 12 months, and you bought the seven other contracts that offered you the largest monthly return based on backwardation? An index tracks this specific commodity investment strategy. It's called the SummerHaven Dynamic Commodity Index (or "SDCI," for short). An ETF now follows this specific strategy, too – the U.S. Commodity Index Fund (USCI), so it's possible for individual investors to follow this strategy. Over the period of our study, the SDCI earned investors a lot more than stocks (more than 10% a year) but had less volatility. Looking at the data, it occurred to me that owning a 100% commodity portfolio would still be too volatile for most investors. Even though the returns are higher, the volatility in commodities (as measured by SDCI) was still almost as high as stocks. And knowing that bonds are less volatile, I figured that adding in some bonds would reduce the portfolio volatility. But looking forward, I'm worried that bonds won't perform well. What do I think is going to perform well during the next bear market in stocks? Gold. Thus, this portfolio would either be 50% commodities and 50% bonds... or 50% commodities, 25% bonds, and 25% gold. Gold is a great hedge against the bond market, if you only own it when it's trending higher. This portfolio – made up of commodities, bonds, and gold – generated annual returns greater than stocks (9%), with a volatility that was about half of stocks (8.7%). It generated returns that were 50% higher than bonds alone, too, which more than compensates you for the increase in volatility. What's interesting to me about this research is that our subscribers almost universally own stocks and avoid commodities. 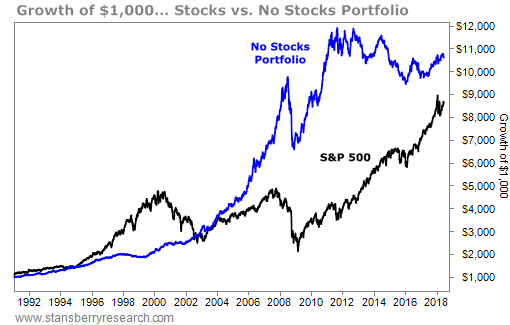 And yet, it turns out that this portfolio, which excludes stocks and is heavily allocated to commodities, offers vastly better risk-adjusted returns. Yes, stocks can be part of that solution – provided that you're willing to be conservative and to adopt at least some of our risk-management tools. But the next level is to think about what (beyond stocks) can help you achieve your investment goals with the least amount of risk. In that regard, I'm certain that adding bonds, commodities, and gold to your portfolio – and in the right way – can be incredibly helpful. I hope you'll consider doing so. Going forward, I expect the same kind of results for Steve Sjuggerud's latest project, True Wealth Opportunities: Commodities. But whether you follow our advice or you buy ETFs and index funds for your allocations, you should definitely consider this approach to wealth management... And you should make these changes right now. Stocks won't trounce gold and commodities forever. Editor's note: Gold and commodities are among Porter's favorite investments to prosper during the coming financial crisis, which he believes will be the worst of our lifetimes. To help you survive and profit during this era of uncertainty, he just released a brand-new, 278-page book called The Battle for America. Right now, you can get a hardback copy for just $19. Get the details here.